After our short stay in LA, we flew to Tahiti for our “holiday from the vacation” time. The flight took about 7 hours from LA to Papaeete.As predicted, the plane was filled with honeymooners. While we’re a long shot from being honeymooners (having had ours 6 years ago), we didn’t mind being with newlyweds in the plane. Love was in the air! You can easily tell they were all newlyweds. The way they looked at each other, and the most tell-tale sign for me are the female’s nails. Almost all had a perfectly square, french manicured nail. 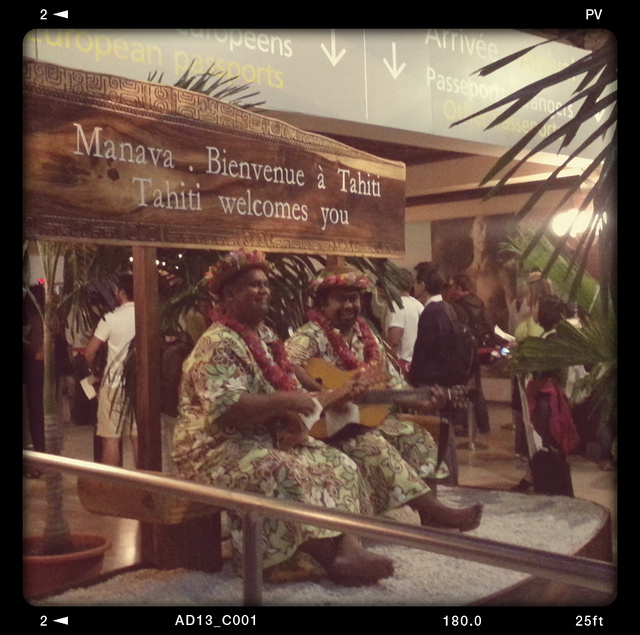 We took the red-eye flight out of Los Angeles and landed in Papeete around 6 AM. 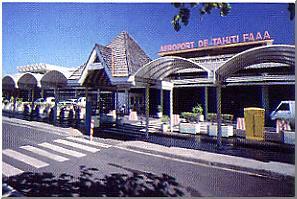 Papeete Airport, or Faa’a International Airport, has got to be the warmest (both temperature and the welcome) and friendliest airport. Ever. This is the line to go through customs and immigration. If going to the US from New Zealand (as we did in the beginning of our trip), you will still have to clear customs like this before reaching the departure gate bound for LA. I didn’t mind it at all. Even if it’s in the middle of the night or at the break of dawn, a very lively welcome like this soothes the travel-weary soul. 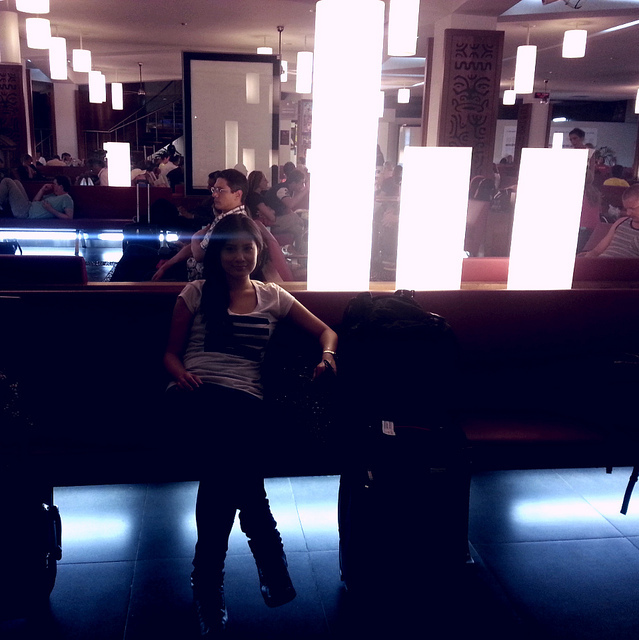 This is the waiting area for departure. It’s very open and airy. We collected our bags and waited for our connecting flight to Moorea. 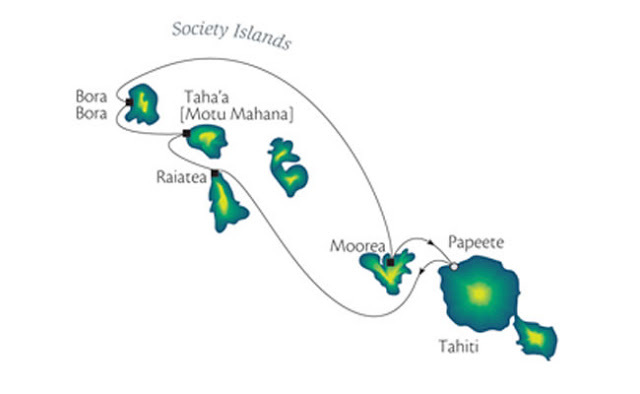 This is a map that shows the common cruise routes in French Polynesia. I just posted it here to show the islands we went to. We landed in Papaeete and then flew to Moorea, and then to Bora Bora 5 days later. We were too tired to explore the city for just a short time. Across the airport, there is a luggage storage facility but we decided to just rest inside the airport. While the airport is pretty small, there are a number of food stalls / eateries (wouldn’t really call them restaurants) inside the airport. Most of them were closed as we were there in the wee hours of the morning. The picture on the packaging described it perfectly. Thick, firm pancakes sandwiching ham and cheese. Very basic but filling enough. Er… none of us did. 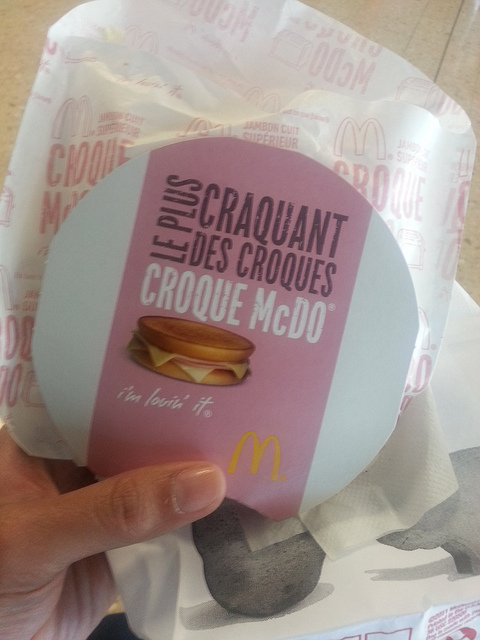 (though my name often fooled a lot of Tahitians into thinking I can speak French. I wish I did!). 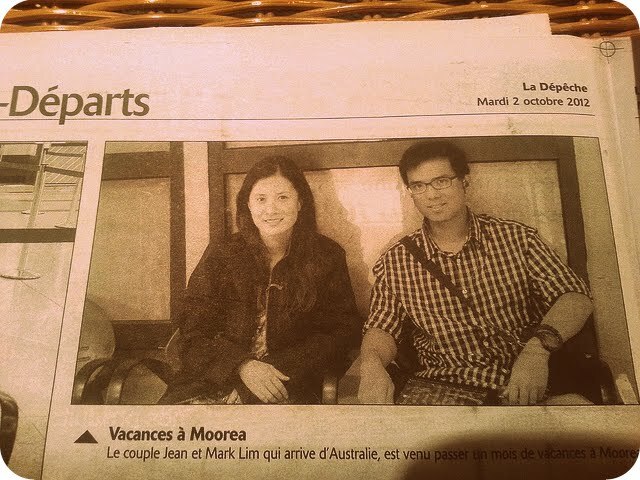 Anyway, after much interpretation with the help of the kind lady sitting next to me (a fellow passenger), it turned out that the lady who woke me up was a photographer/journalist for La Depeche de Tahiti (local newspaper) and she wanted to take our photograph to feature tourists arriving in French Polynesia. Well we barely had any sleep, we were at our most haggard and I’m sure my eyebags had excess luggage than usual, but WHY ON EARTH NOT??! The convenience store owner (where we saw the copy of the newspaper) gave us two copies for free when he recognised it was us in the paper. Merci Beaucoup!!! And so this starts our wonderful journey in French Polynesia. WHAT ‘S THE FRIENDLIEST AIRPORT YOU’D EVER BEEN TO? HAVE YOU EVER HAD ANY UNUSUAL AIRPORT EXPERIENCE? Review: Intercontinental Tahiti Resort Miss Poehine: Tahiti’s Transgender Pageant How to Get to Tahiti and the Maldives, Wherever You’re From Eating and Dining in Tahiti (Bora-Bora & Moorea), French Polynesia Tahiti vs Maldives: Which Paradise Should You Go to? in a nutshell so far..